Want the news directly in your inbox? Sign up for the newsletter! ​CAN YOU KEEP A SECRET? Pay attention. I have some very important news. It's about two upcoming projects. But these projects haven't officially been announced yet. Which means I'm technically not supposed to tell anyone about them. If my publishers find out I've shared this top secret intel with anyone, I'd have to go into hiding. Change my name. Wear a fake mustache (see image below). Things would get real awkward, real quick. But I'm just too excited to keep my mouth shut any longer. So, here's the deal. I'm going to share the news. But just with you. Right here on this ultra-secure website. And only under ONE condition: You have to PROMISE to keep it a secret. No blabbing to your friends, family or the media. Can you keep this to yourself? There you go. Now you know about my secret projects. Just to be safe, you might want to invest in a few fake mustaches. Never know when some angry publishers will come banging on your door. It's always a thrill to see the international editions of my books. Because international publishers usually bring in completely different people to design and illustrate the cover, every time a title comes out in a different country, it looks like a completely different book. Which is so fascinating! All these different interpretations of the exact same story! Some are bright and colorful and cartoon-ey. Others look like something Tim Burton might've dreamed up. Each time I see a new version, it's a wonderful surprise. ​In the past few days, I received international editions for both the Joshua Dread and Legendtopia series. And I've gotta tell you--they're AMAZING! First up, the Israeli edition of Joshua Dread: The Nameless Hero. This one's super interesting because the publisher Keter also completely redesigned the first book as well. (You can see the original here.) With this redesign, the first and second book have a similar style that is instantly recognizable, but they're also different enough that you don't accidentally mistake one for the other--perfect for a series! ​Take a look for yourself. The first book is on the left, book #2 is on the right. 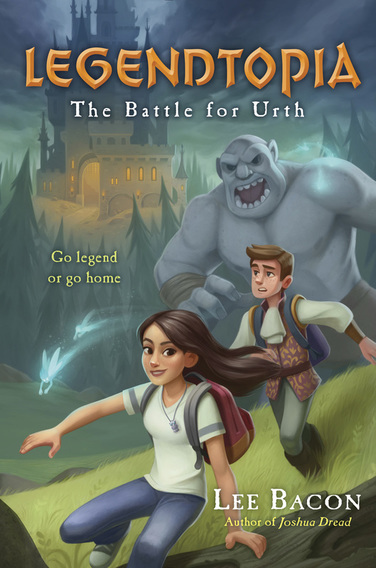 Up next is the Spanish-language cover for Legendtopia: The Battle for Urth, published by V&R Editora. Usually, I only show the front cover, but this one looks so cool on the back that I wanted to share the entire cover--front, back and spine. Big thanks to both publishers for the great work they've done on these books! I may not be able to read them, but I love the way they look! I am a liar. Might as well get that out in the open now. If you open a copy of my most recent book – Legendtopia: The Shadow Queen – to the back flap, this is what you’ll see. Is it the author photo? 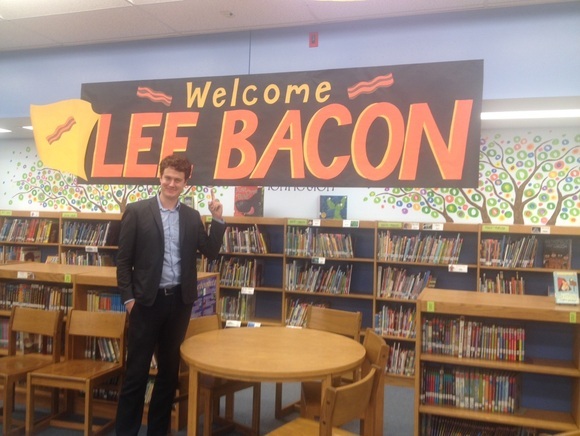 Maybe the person in the picture is not really Lee Bacon! 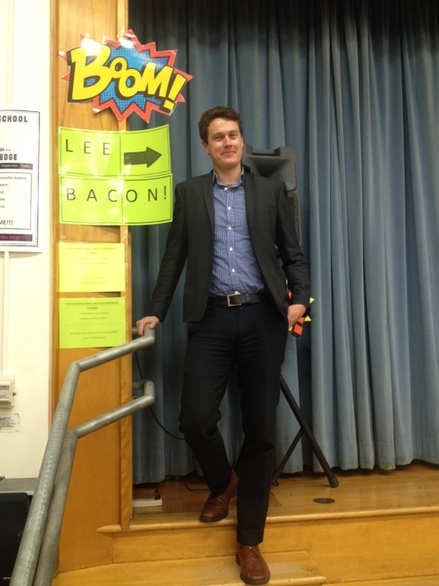 Maybe the real Lee Bacon hired some other guy to pose as "Lee Bacon" so that he could maintain his precious anonymity. Nope. That’s not the lie. Keep looking. What else do you see? “Author of Legendtopia: The Battle for Urth and the Joshua Dread series”...all that checks out. Next line: Germany...Castles...Dragons. Yes, yes, and yes. All true. But what about that last line? “He now lives in Brooklyn”? That's right, folks. We have stumbled upon a big fat lie. I don’t actually live in Brooklyn now. In September 2016, my wife and I packed up our lovely apartment in Brooklyn and moved to a house in Maplewood, New Jersey. So why does my book jacket still claim that I live in Brooklyn? Well, the reason comes down to the sloooooow pace of the publishing business. When the first Legendtopia book was in the works, I was still a Brooklynite. And so when I submitted my author bio (yes, that’s something the author writes), I included the line about living in Brooklyn. But then time did its thing. Months went by. And when the second book arrived in the world, the whole “lives-in-Brooklyn” part of my bio was no longer true. So there you have it. I am a liar. I live in Maplewood. And therefore, I decided to hold the book launch for Legendtopia: The Shadow Queen in Maplewood. Luckily, our little town has an amazing local indie bookstore. I love [words]. I’ve wandered the shelves there on countless occasions. Sometimes it’s a planned thing. Sometimes, I just seem to drift inside, as if the books are secretly singing to me through the window. [words] brings in TONS of amazing authors and hold other terrific events for the community. Which is why I was so thrilled and honored and slightly nervous to officially launch my newest book there. The launch event took place on Saturday, June 17. Some of the attendees ventured out from NYC, while others included our new friends and neighbors from town. 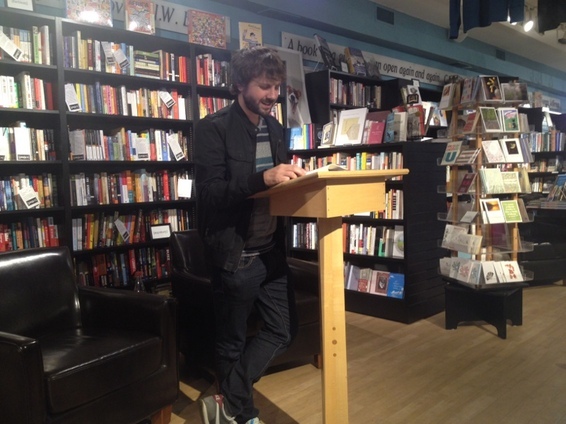 Here I am, attempting to form a coherent sentence in front of so many nice people. Afterward, a little book signing action took place. The event was a blast! But the fun wasn't over yet. Because when I got back home, I found a surprise waiting for me in our driveway. In case you're wondering...no, the sign wasn't the result of a magic spell by the Sorceress. It was created by our wonderful neighbor Krysia and her son Jack. Here I am posing with them and the sign. I had a legendary time at the Legendtopia book launch. Big thanks to [words] for letting me hold the event at their lovely bookstore, to all the folks who came out, and to my generous neighbors for creating such a cool, whimsical sign! I might be a liar, but I also feel extremely lucky. LEGENDTOPIA 2: THE SHADOW QUEEN is out now! Two is an important number in the LEGENDTOPIA series. There are two main characters: Kara Estrada and Prince Fred. They come from two different worlds: Earth and Heldstone. They're caught in a battle between two powerful forces: good and evil. Even the title is a mash-up of two words (LEGEND + UTOPIA = LEGENDTOPIA). And another way that the number two is significant in LEGENDTOPIA: There are two books in the series! And the second one just came out! From the earliest stages, I had an idea of telling Fred and Kara's story as a duology--a two-book series. I imagined it like a mirror. One book would be a reflection of the other. The first would take place almost entirely in Kara's world, Earth (or "Urth," according to Prince Fred). And the second would take place almost entirely in Prince Fred's world, Heldstone. 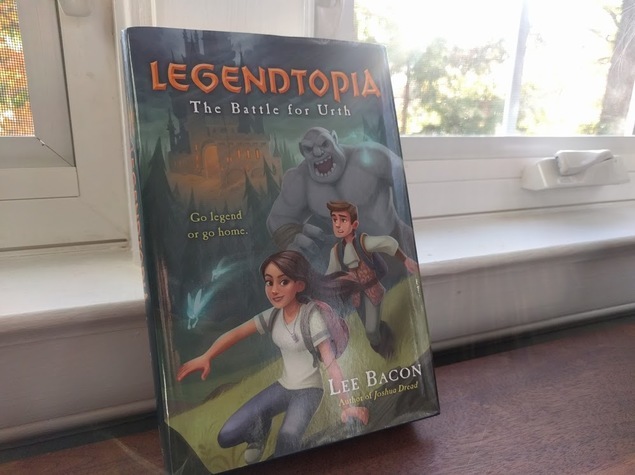 After the first book in the series--LEGENDTOPIA: THE BATTLE FOR URTH--was published a few months ago, the wait for book #2 is finally over! The second--and final--book in the series hit bookstores on July 13, 2017. The official title is LEGENDTOPIA: THE SHADOW QUEEN. And--WOW!--I love how the final version turned out! The cover was illustrated by the same amazing artist who did book #1: Alyssa Petersen. You can check out more of her work here. The first book included a map of Kara's town of Shady Pines. In book #2, the action has moved to Prince Fred's neck of the woods. And so when you open up the book, it comes with a brand new map of Heldstone. I'm so excited that the conclusion to Kara and Fred's journey has been published. Find out more! Check out some nice blurbs! Order a copy! Basically, everywhere they speak German! On April 27, 2017, LEGENDTOPIA was published in German-speaking countries by Fischer Verlag. This is the same publisher that did such an amazing job with the JOSHUA DREAD series. I mean, seriously! Those are some great covers! By the way, Joshua Dread is called Joshua Schreck in the German editions because the German word "Schreck" translates to "Fear" or "Terror" or--you guessed it!--"Dread". I love the way these books turned out. Which is why I was especially excited to discover that Fischer would also be publishing LEGENDTOPIA! And once again, they did an amazing job on the cover. I love what this cover accomplishes. It conveys a sense of danger and mystery, but with the potential for fun and adventure. Exactly what I wanted to achieve while writing the book. The subtitle--"Im Bann der Zauberin" translates to "Under the Spell of the Sorceress." As they say in German, "Das ist Toll!" I'm thrilled to announce the publication of my newest book: LEGENDTOPIA: The Battle for Urth. School Library Journal called it "a quick and easy title sure to appeal to both avid and reluctant readers, particularly fans of light adventure fantasy with doses of comedy." LEGENDTOPIA: The Battle for Urth is the first in a brand new 2-book fantasy series. There's magic, dragons, talking animals and ogres in the boys' bathroom. What's not to love? יהושע אימה זמין כעת עברי !!! Well, this is super exciting. 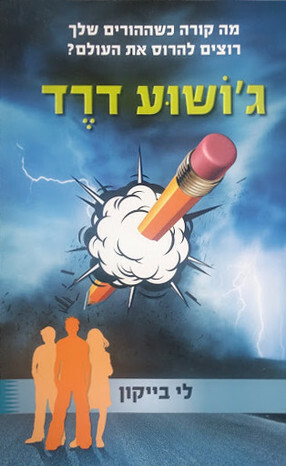 Joshua Dread has been published in Hebrew by the Israeli publisher Keter Books! They say you shouldn't judge a book by its cover. But since I can't read a word of Hebrew, I don't have much else to go by. Fortunately, I LOVE this cover. It's bright and exciting. It features silhouettes of Joshua, Sophie and Milton. And there's an exploding pencil. So awesome! ​I could write many paragraphs about how perfect this cover is, but I think you’ll be able to see that for yourself. So I’ll keep this short. My upcoming novel, LEGENDTOPIA: The Battle for Urth, comes out November 8, 2016. It’s the first in a brand new 2-book series. The cover was illustrated by the very talented Alyssa Petersen. And it is amazing. A New Series is on the Way! What is Legendtopia? Gee, I'm glad you asked! Legendtopia is a funny, action-packed fantasy story. It's a 2-book middle grade series that will be published by the same fantastic folks who published JOSHUA DREAD (Delacorte Press/Random House Children's Books) here in the U.S. And as much as I absolutely love the world of Joshua Dread, this new series features an all new cast of characters in an all new adventure. That said, I have a strong hunch that fans of Joshua Dread will love Legendtopia. Kara and Fred are from different worlds. Literally. She’s a regular sixth grade girl. He’s a young prince from an enchanted kingdom. But when they unexpectedly meet, neither of their lives will ever be the same. There she meets Prince Frederick the Fourteenth, heir to the throne of Heldstone (Kara calls him Prince Fred), as well as a beautiful and terrifying Sorceress. Prince Fred is bored of his life in the kingdom where he is coddled and protected from danger by his royal parents. He wants adventure and he decides to follow Kara back to her town. The problem, however, is the evil Sorceress also decides to leave the kingdom and starts wreaking havoc, bringing dark magic to the suburbs. She turns Legendtopia into a real fortress and it’s up to Kara and Prince Fred to overcome spells, ogres and a dragon to stop her and save the world. The first book in the Legendtopia series is slated to come out in the fall of 2016. Until then, stay tuned for more updates! Thanks to everyone who helped make this such an incredible year for me and Joshua Dread! Happy holidays! 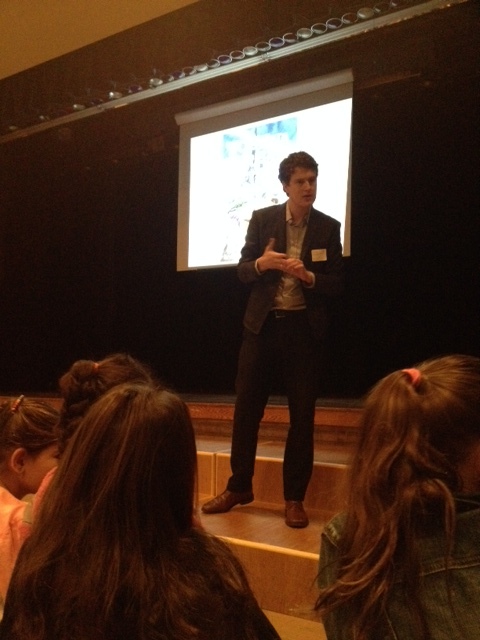 I do school visits. Lots and lots of school visits. 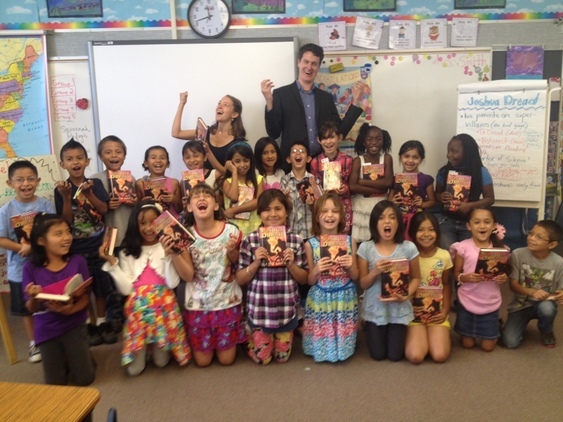 Since the publication of the first book in the JOSHUA DREAD series, I’ve visited over 200 schools, all across the country. During these visits, I get to meet so many bright, creative, interesting kids. It’s a great way to interact with the people for whom I actually write these books. To discover what makes them laugh, or squirm with suspense, or gasp. The entire experience motivates me to keep writing, to continue trying to come up with stories that I can share with young people out there. But don't take my word for it. Here's some photographic evidence! I'm not sure why, but something tells me I'm talking about "The Dominion Key"
I'm pretty sure he knew more about these books than I ever will. 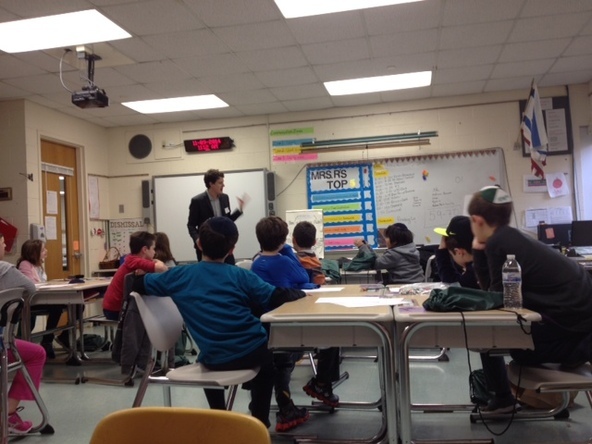 I got the chance to speak during the Young Writers' Workshop at Solomon Schechter School in Westchester. Such fun! Lots of eager hands in the air! Being a writer is dangerous. 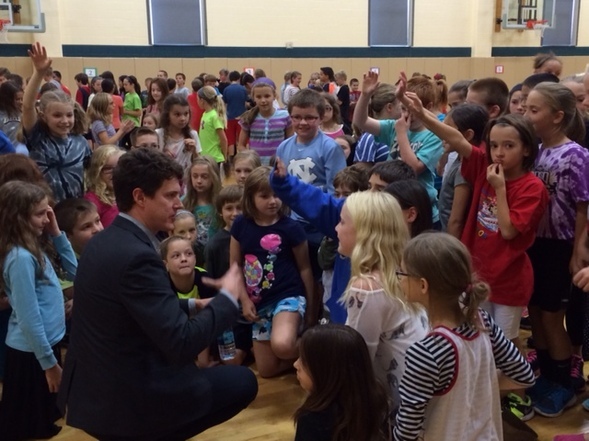 If you're not careful, you can get mobbed by 4th graders. Sometimes readers send me emails. This makes me happy, because reader emails are almost always very nice. I suppose I wouldn't like it if people were all writing to say, "Dear Lee, your books are terrible and you probably smell bad." Luckily, nobody's written me an email like that. At least not yet. Basically, when a kid or a parent or a teacher writes to me, it lets me know that the book connected with someone out there. That my book made a difference in someone's life. And that's a pretty good feeling. What is your favorite book of all the books you have written? Why? Picking a favorite book seems mean. They're all so special to me. But if forced to choose, I'd have to say the first Joshua Dread book--simply because it was the first thing that I ever managed to get published and that will always be meaningful for me. Of all the books you have read, which one have you never forgotten? Why? James & the Giant Peach, by Roald Dahl. It was the first book that made me realize that books can do ANYTHING. They can be weird and funny and creepy and wonderful--all at the same time. When you close your eyes, what part of your favorite book plays a movie in your head? I'm going to try it now. Here goes. LJlkjsedfl. Oops. I just tried to type with my eyes closed. That doesn't work very well. But the scene that passed through my head was from James and the Giant Peach: When the enormous peach rolls over and squishes James' evil aunts. If you had to have another career, what would it be? I would be a translator because that was the job I had before my book got published. What advice do you have for 4th graders who need to narrow their topic? Focus. Make a checklist and set goals. Keep working on it! If that doesn't work, tell your teacher that Lee Bacon gave you terrible advice and if anyone deserves a bad grade, it should be him! Brussels sprouts--but they have to be cooked just right. Otherwise, they can be kinda gross. Look out Germany...Here comes Joshua Schreck! If you've explored other parts of this website, you might already know that I lived for a while in Munich. It was during this time that I began reading children's books in German as a way of improving my language skills. I also read a few kids' books in English. I even started writing a children's book of my own. The book became Joshua Dread. So it was a huge thrill for me to learn Joshua Dread was also being published in German, under the title "Joshua Schreck". (Schreck is pronounced like the name of the big green ogre from the movies, but it's spelled differently and means "fear" or "dread" in German.) 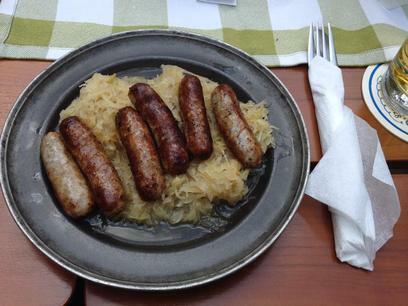 And now I'm writing this from Germany, where I've had the opportunity to do a couple of book events -- while also seeing lots of friends and eating way more sausage than I'm accustomed to eating. 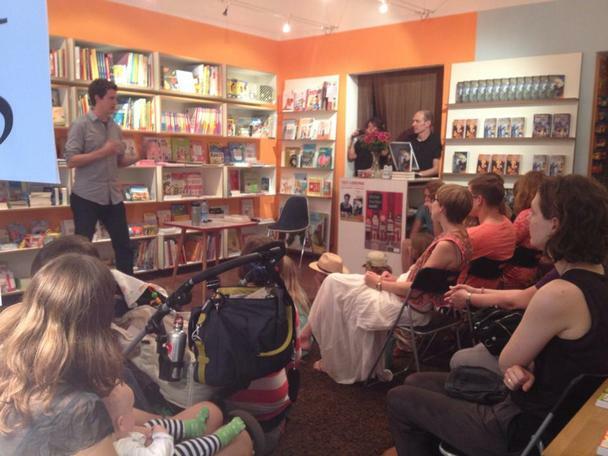 My first German event was held at the LeseLotte Bookstore in Munich. I was honored that so many people came out on a rainy Saturday to listen to me talk about the book in German and make lots of embarrassing and/or hilarious mistakes along the way. 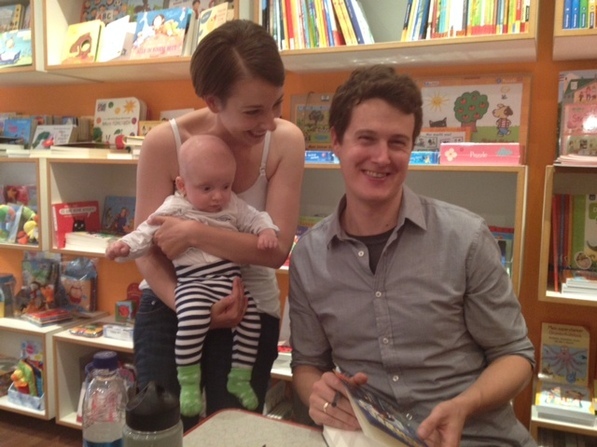 And here I am meeting a young and precocious reader (as well as his mom). Never too early to get kids reading about supervillains, zombies and killer robots. 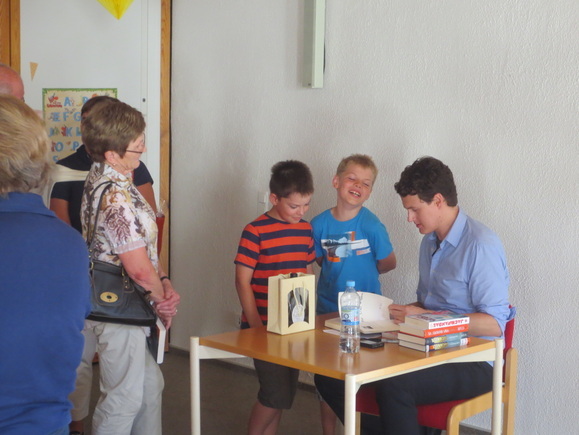 The next stop on the Lee Bacon Attempts To Talk About His Book In Another Language Tour 2014 (better known throughout the world as "LBATTAHBIALT 2014") was Alzenau. If you've never heard of Alzenau, no need to feel bad. Very few Germans have heard of it either. Alzenau is a small and lovely village near the border of Bavaria and Hesse. It's surrounded by idyllic hills and vineyards. It has its very own castle. And it's also the place where my wife grew up. My parents-in-law still live there. 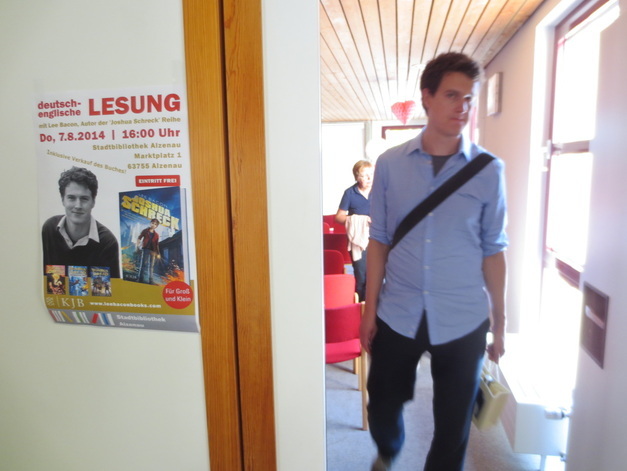 And I was very pleased to have the chance to hold an event at the Stadtbibliothek (City Library). Wanna see a few photos? Of course you do! I would like to extend a heartfelt "Dankeschön" to all those who helped to organize LBATTAHBIALT 2014, as well as those who came out to the events. I've had an incredible time. Already looking forward to the next Germany trip! 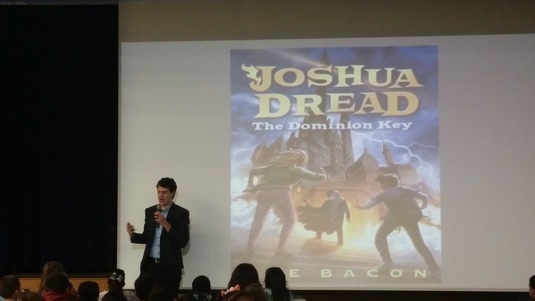 I was lucky enough to be in California for the launch of "The Dominion Key" on May 13. And it couldn't have been a better trip! I visited lots of schools and met SO MANY awesome librarians, educators, booksellers, parents and--of course--young people. Here are some pictures from the trip. 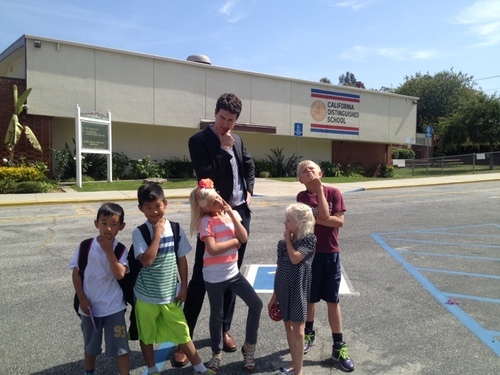 At Rancho Vista Elementary in Los Angeles, a few youngsters and I took a moment to practice out "fancypants author" poses. I think they got the hang of it. During an event at Pages Bookstore in LA, I was joined by a very special guest: Maxwell Glick, the voice of all three Joshua Dread audio books. Maxwell lives in LA, and I was thrilled to finally meet the person who does such a great job of bringing these books to life in the audio versions. In addition to being a voiceover artist, actor and YouTube celebrity, Maxwell is also a really cool guy. He took the podium to read a little excerpt from The Nameless Hero. No surprise, he was great! 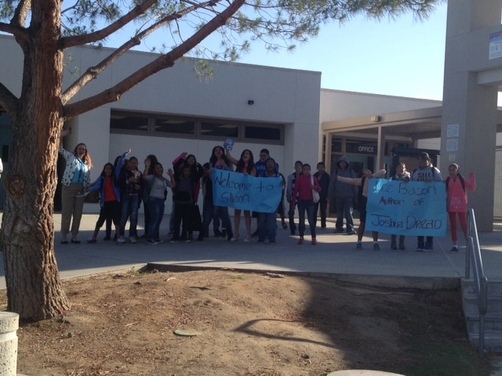 Pulling up to Stiern Middle School in Bakersfield, I noticed a large group of students waving and holding up signs. My first thought: "Uh oh. Must be some kind of protest. What horrible thing did I do this time?" But as we approached, I realized: It wasn't a protest; it was a welcoming committee! I also found moments to take pictures next to posters and banners of my own name. Nothing egotistical about that! 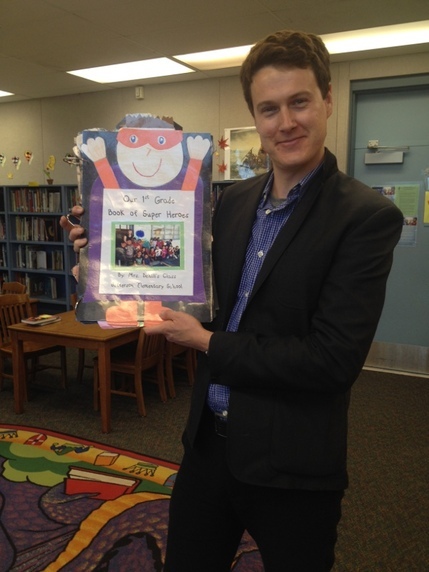 At Munsey Elementary, I met Miss Smith's wonderful second grade class and we worked on our supervillain laugh. Mwahahaha! 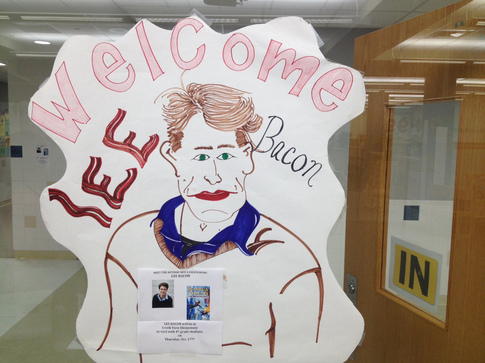 One of the (many) cool things about visiting schools is that students and teachers put together some incredible posters and banners to celebrate the books. Authors love this kind of thing! It's such a thrill and honor to see people engage with the books in such a creative way. I was blown away by the talent I came across at the different schools. 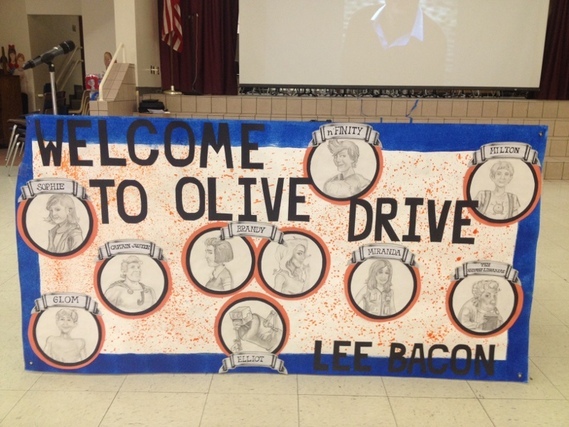 For example, Olive Drive Elementary, where a member of the school staff drew pictures of the characters from the series. Those aren't photos, people. They're illustrations. 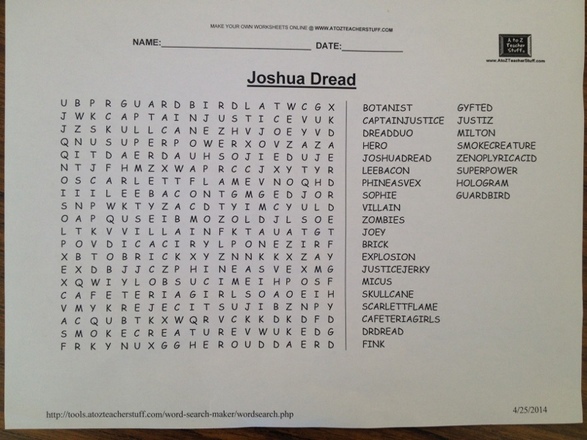 One class created a word find based on JOSHUA DREAD. I'm still searching for "ZENOPLYRICACID". ...and this delightful Book of Super Heroes, created by a 1st grader. I don't remember what kind of creative projects I was doing in the first grade, but I'm pretty sure they weren't nearly this good! I had such a blast visiting California. Already looking forward to the next trip! If there are any Academy Award voters reading this (and I'm sure there are quite a few! ), I'd like to suggest that you consider nominating this video for next year's Oscars. Might I recommend creating a new category? Perhaps something along the lines of, "Best Short Video That Was Made To Talk About How Excited The Author Is To Be Selected For The Awesome 'Spirit of Texas' Reading Program." Or maybe: "Best YouTube Video That Features Texas Twang, Brooklyn Snobbery, An Action-Packed Explosion, An Artsy Foreign Film, Sincerity & An Outtake At The End." I have to say, if that category existed, I'd have a pretty good shot! Hope you enjoy! And I'll see you at next year's Academy Awards! 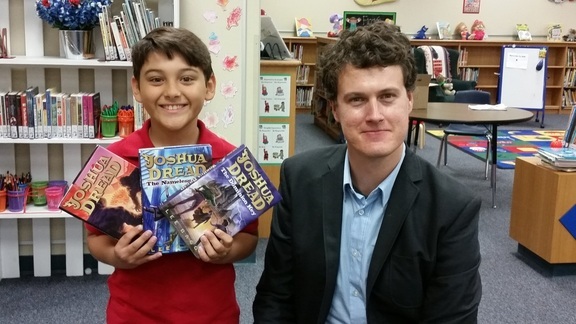 Joshua Dread Selected for the Spirit of Texas Reading Program! I'm honored and thrilled to have been selected as a featured author for the Spirit of Texas Reading Program! The Spirit of Texas Reading Program is a recommended reading list developed by public and school librarians from the Young Adult Round Table (YART) of the Texas Library Association. The purpose of the list is to encourage students in grades 6-8 to explore a variety of current, quality books from Texas Authors, develop critical reading skills, and to encourage greater interaction between Texas authors, Texas Librarians, and Texas school children. I live in Brooklyn, but I grew up in Texas. 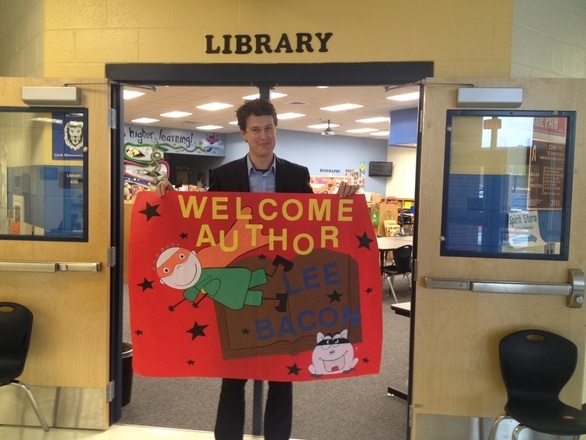 And one of the coolest things about becoming a fancy-pants published author is that I've had lots of opportunities over the past year to return to my native state for school visits, bookstore events, conferences and all kinds of fun. Over the past month, I was in Texas on two separate occasions. Things kicked off in College Station, the town where I grew up. I re-visited my alma mater, Oakwood Intermediate School, as well as Cypress Grove Intermediate. 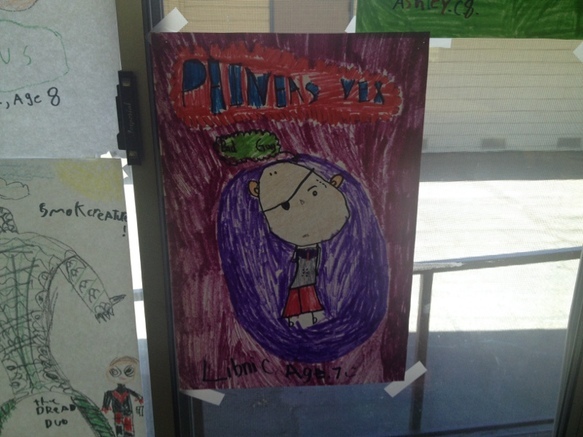 And I also made my very first visit to Creek View Elementary, where I was met with a lovely portrait of . . . ME! 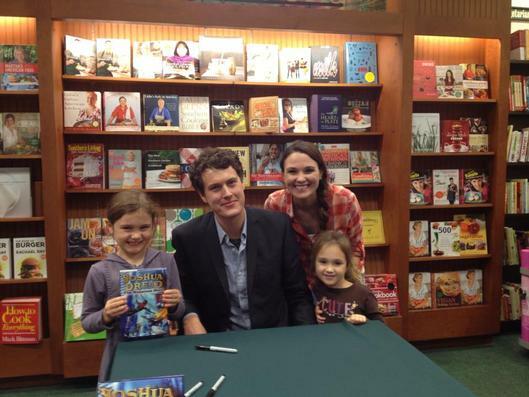 In College Station, we also held an event at the local Barnes & Noble. There I had a chance to say hi to a friend from high school, Kim Ellison Russell, as well as her adorable kids. 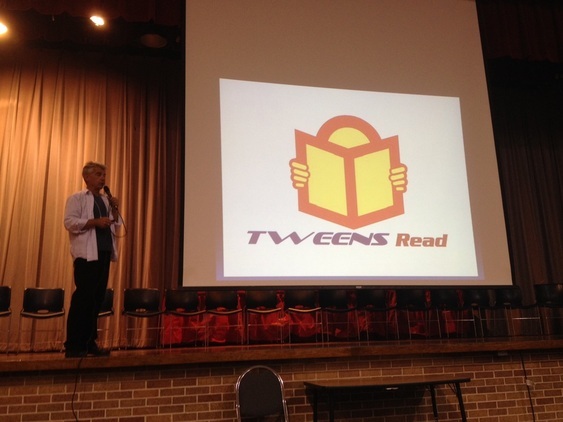 After College Station, it was on to Houston, where I participated in the Tweens Read Book Festival. Organized by fabulous Blue Willow Bookshop, the Tweens Read Festival drew huge crowds of young people, who came in from all over the state (and even some from other states). I was thrilled at the chance to talk with so many bright, enthusiastic tweens, as well as the many volunteers who made the event run so smoothly. And it was an amazing opportunity to hang out with some of my favorite authors, such as D.J. MacHale, who delivered the keynote address. 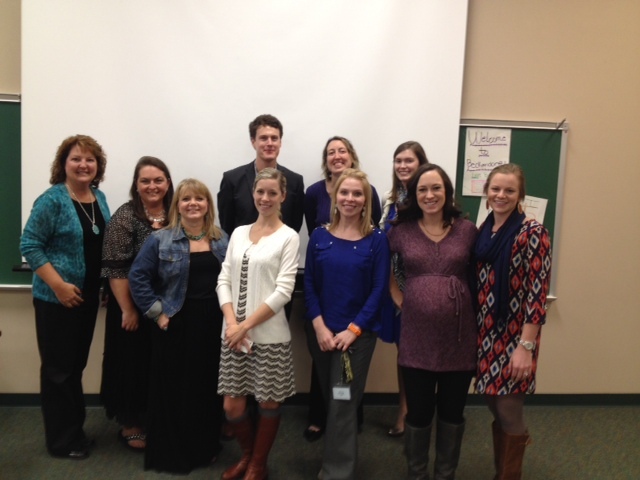 And I also got the chance to hang out with the lovely 6th grade teaching crew. 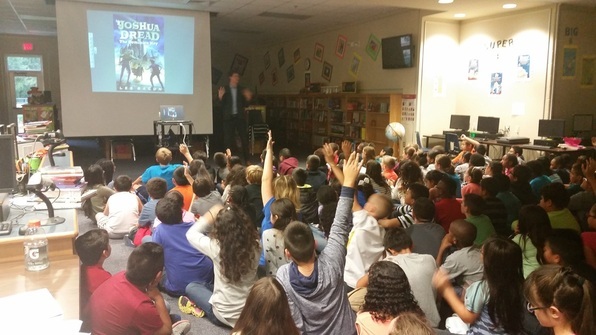 With another great trip to Texas under my belt (which of course has a big, shiny Lone-Star buckle), I just wanted to say thanks to all the librarians, teachers, PTA members, parents and friends who made me feel so welcome in my native state. And to all the students who I met along the way, I want to say: YOU GUYS ARE AWESOME! Keep reading and keep writing! I have good news and bad news. Okay, well actually, I have good news and bad news and more good news and yet more good news and great news. However, Random House has posted the quiz online, and it’s a lot of fun! By filling out a mere 9 questions, it gives you the chance to figure out your future career. Will you become a superhero? Or a supervillain? Or perhaps something in between? All of which means that the version of the paperback WITHOUT the quiz is going to be a very rare collector’s item. Which is GREAT NEWS for those of you who manage to snap up a copy. So here’s my advice. Visit your local bookstore (or go online) and seek out a copy of the paperback ASAP. Then go online and take the quiz, so you can find out whether you’re a superhero . . . or a supervillain? Or if you can’t wait, go here to take the quiz. A New Book! A New Hero! I'm thrilled about the publication of the second book in the "JOSHUA DREAD" series: THE NAMELESS HERO, which Kirkus Reviews gives "a superpowered thumbs up!" This is a book that I'm very proud to have written. It takes many of the elements from book one (wild adventure, twists, humor, supervillainous mayhem), but also feels like a story that's able to stand on its own. At least I hope so! Joshua meets new friends, new challenges, and some extremely unpleasant new enemies. Along the way, he gets recruited to join a team of superheroes, battles a gooey, green replica of himself, and becomes an overnight celebrity sensation. The action picks up seven months after the first book ended. The last year has been hectic for Joshua Dread. His supervillain parents tried to destroy the world. He discovered that he has a superpower. He and his friends nearly died a few times. And now that it's the last day of school, all Joshua wants is to enjoy a relaxed, stress-free summer. But this plan kind of falls apart when Joshua, Sophie and Milton are attacked by the substitute librarian. Who also happens to be a vicious mutant. Don't you hate it when that happens? One thing's for sure. Any hope for a stress-free summer just went up in flames. Find out more about "The Nameless Hero" here. There's an area of Manhattan, a single block between Chelsea and Union Square, that's one of my favorite spots in a city full of wonderful spots. There's an art store and a stationary store (I don't know how one hasn't driven the other out of business by now). 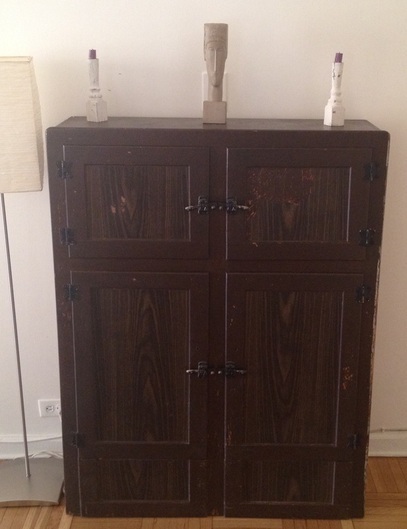 On this block you'll also find a charming antique shop where, once, on a whim, I bought a chest of drawers that had been converted from an old wooden ice chest. A relic from a time when ice was delivered on horse-drawn carts. Now it holds our abundant tote bag collection, bottles of wine, and paper towels. On this block you'll also find The City Bakery. 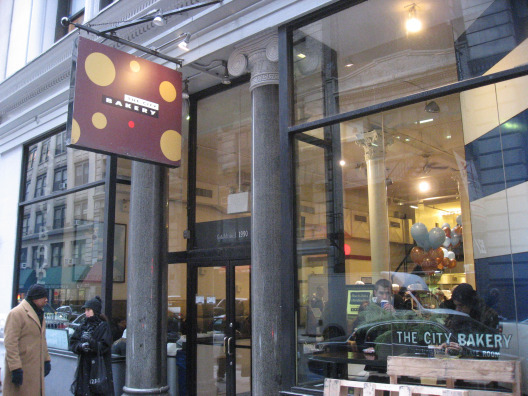 On many, many occasions, I've gone to City Bakery to sit at an upstairs table and enjoy a delicious chocolate chip cookie or pretzel croissant, along with an iced tea and a good book. 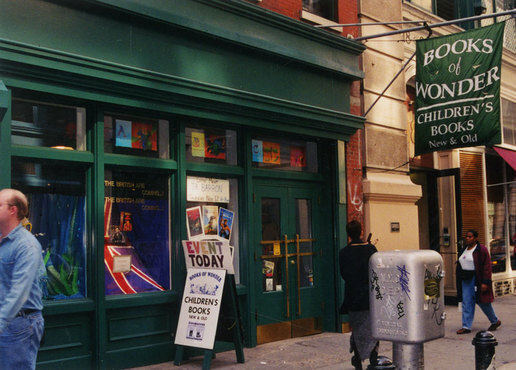 Afterward, my next stop is inevitably Books of Wonder, just on the other side of the street. 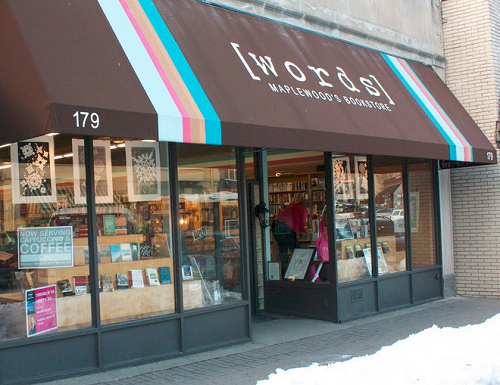 Books of Wonder is devoted entirely to children's books--everything from picture books to YA. The staff is intelligent and committed. The walls are covered with cool original illustrations from classic children's books. It's a perfect place to wander, discover something new, or purchase a book that I've been meaning to read for way too long. 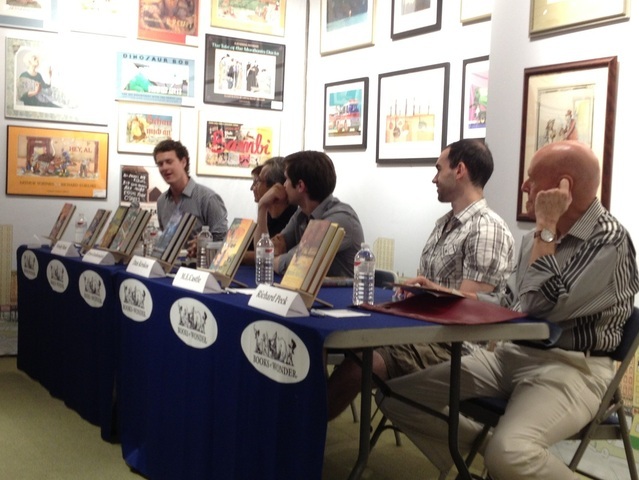 And on a recent Saturday, I took part in a panel there. This was such a thrill and honor. Especially since I got the chance to share a table with some terrific fellow middle grade authors. I'm the guy at the far end of the table, with my eyes closed. The other authors were: Wendy Mass, Chris Grabenstein, Dan Krokos, M.E. Castle and Richard Peck. Such a fun event! Okay, maybe that's a bit of an exaggeration. The more accurate thing would be to say that the series is taking over a small part of the bookshelves in the children's section of some bookstores in certain countries, including Australia, New Zealand, Germany, Spain, France, Israel, Taiwan and Hong Kong. And while that may not quite merit an over-the-top supervillain laugh, it does at least make me feel very happy. The book publication process is extremely sloooooow under any conditions. Add to this the delay in acquiring the book internationally as well as the translation time, and it’s clear why the book still hasn’t been published in most of these other countries. However, I have gotten a glimpse of the covers for some international editions, and wanted to share them here. Australia/New Zealand are the only countries outside North America that have published the book so far. And the publisher—Hardie Grant Egmont—has done a marvelous job of getting readers excited about the series. The cover that they used is actually the original cover design by Brandon Dorman, the illustrator for the Joshua Dread series in the US. Before the book was published here in North America, Random House decided to go in a different direction and asked Brandon to draw up a completely new cover. But I’m so thrilled that the original gets to see the light of day after all. As for “The Handbook for Gyfted Children”...that was the original subtitle of the book. If you’ve read JOSHUA DREAD, you know why. And if you haven’t read it, then what are you waiting for?!?! Get a copy and start reading now! Anyway, late in the process, Random House and I opted to do away with the subtitle. But I believe that several of the international editions felt it was right for their markets. And so we have JOSHUA DREAD: THE HANDBOOK FOR GYFTED CHILDREN. I love it! Hold up? Joshua Schreck? But I thought his name was Joshua Dreck! No, wait—I mean Joshua Drip! No, that’s not it either. But anyway, I’m SURE his name ISN’T Joshua Schreck. Well, because Dread has a certain meaning (fear, trepidation, anxiety) in English, the German publisher decided to give Joshua a name that would have the same connotation in German. Makes sense, right? But you may be asking yourself--Isn’t Shrek that big green ogre guy? The one that was in all those movies? The answer is—Yes! However, that’s “Shrek.” The last name of this book is “Schreck.” Same pronunciation, different spelling. Anyway, the real point is--WOW!—I really, really love this cover. I mean, really. As you might say in German: “Das ist wunderbar!” (“That’s wonderful!”) Or: “Ich will dieses Buch sofort kaufen!” (“I want to buy this book immediately!” Or: “Ich habe ein Kartoffel in meiner Tasche!” (“I have a potato in my pocket!”). Okay, so you probably wouldn’t say that last thing. But still. It’s a great cover. Also: the text near the title translates to: "He wants to save the world. His parents want to destroy it." The German edition, published by Fischer Verlag, will be coming on August 22. This time, Joshua doesn’t just have a different last name. His first name is different too. JACK VANDAL. And that’s not the only difference. The entire look of the cover has changed. All the other covers have only featured Joshua. Or in the case of the US edition, Joshua + smoke creatures. 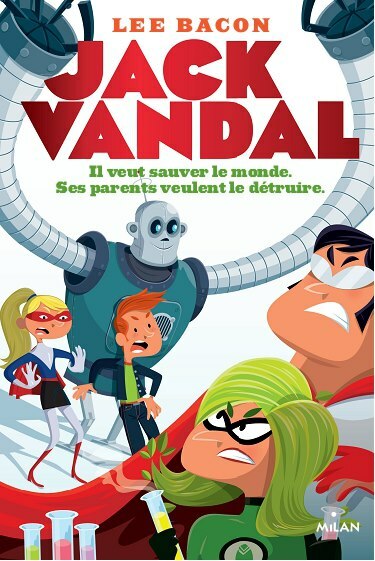 But in the French edition, we get a chance to see Joshua, Sophie, Joshua’s parents, and Captain Justice’s robotic butler, Stanley. Not only that, but the style is quite different. More cartoonish. The other covers were more serious and tense, while JACK VANDAL looks a bit more playful and fun. As with the German edition, the text below the title translates to, "He wants to save the world. His parents want to destroy it." The French edition, published by Editions Milan, is coming out on May 22. It’s been such a fascinating process to see Joshua Dread (or Joshua Schreck, or Jack Vandal) move toward publication in other countries. As I see more covers, I’ll be sure to share them here! 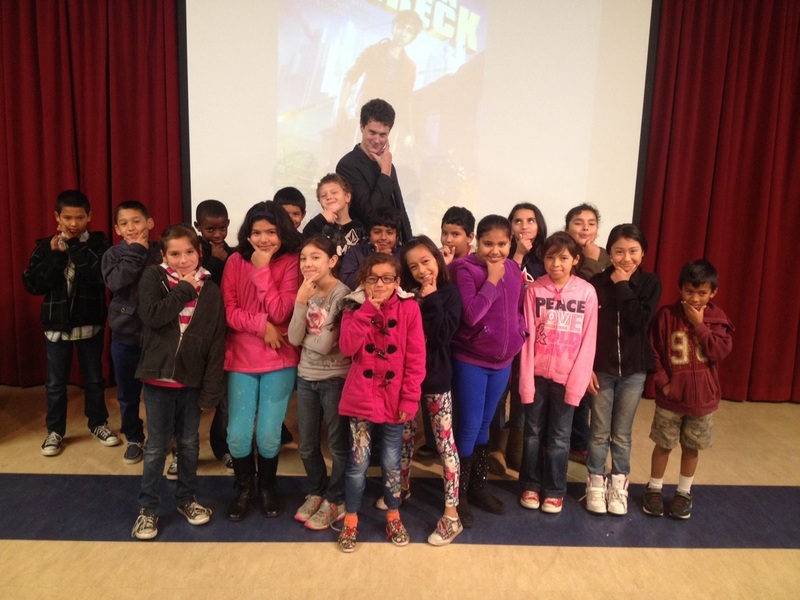 School visits are the best. 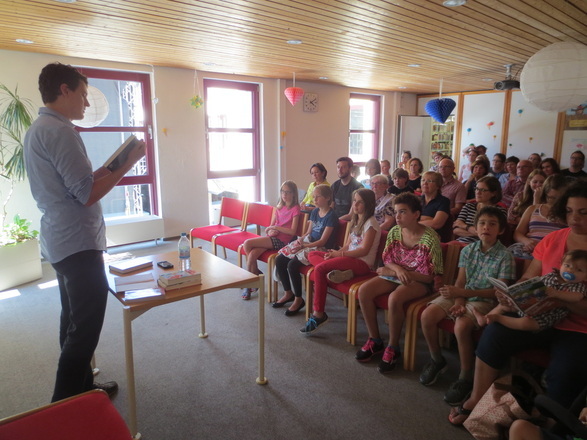 They're a chance to interact with young readers, to talk about my own journey as a writer, and to hopefully get students excited about reading, writing, and creativity. 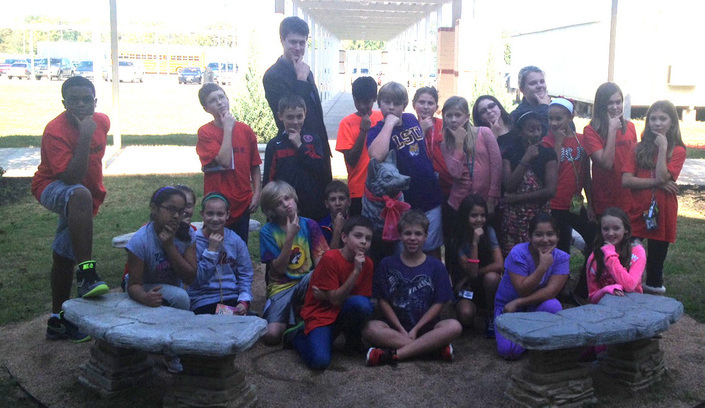 I am constantly amazed by the curiosity, engagement, and cleverness of the students I come across. And by the devotion of their teachers, administrators, and librarians. Another benefit of school visits...the swag. During a recent visit to Spring Branch Middle School in Houston, Texas, I was given a gift bag that included a school t-shirt. When I got home, I tried it on and did a little photo shoot. Here are the results (featuring my cat Pippa). I think Pippa makes a pretty good model, don't you? And here are a few shots from the event itself. 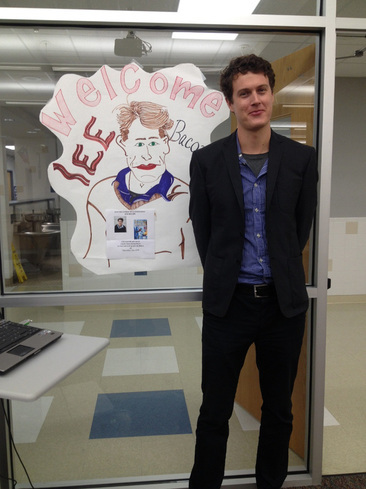 Many thanks to Spring Branch Middle School for making me feel so welcome! Particular thanks go to the spectacular library team, Brandee Smith and Elvira Ayala. During the first week of March, I was fortunate enough to return to my native state of Texas for another round of school visits. 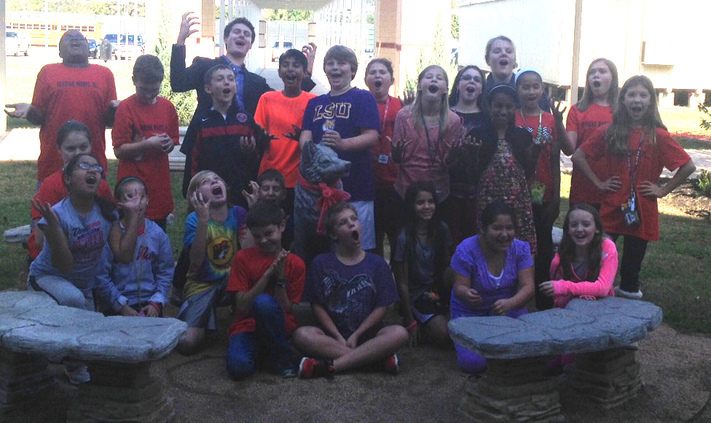 This time I was in Arlington, visiting junior high schools all over town. I got the chance to meet some bright, excited young people, talking to entire auditoriums, small book clubs, and everything in between. Here's a photo from the Shackelford Junior High Book & Writing Club, as well as their fearless leader and amazing school librarian Alicia Vandenbroek (far right). 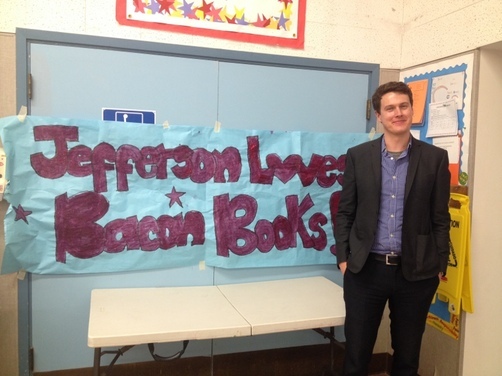 It was so fun to chat with them about reading, writing, and creativity. And I look forward to reading the books that they'll be publishing before too long. 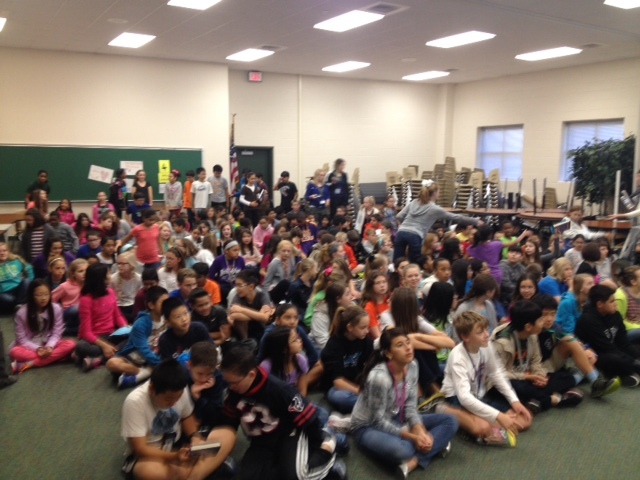 Below is a photo of me giving a presentation to a group of 7th graders from Shackelford. During the Q&A at the end of my talk, I often call on students by saying something like, "You in the green shirt" or "You in the plaid cardigan" (okay, I've never actually called on anyone in a plaid cardigan--yet!). This crowd made it a little harder on me. "You in the red sweatshirt," or "You in the blue t-shirt" didn't really narrow it down much. When I visit schools, students often ask me to sign all sorts of things--notebooks, random sheets of paper, journals. I've even been asked to sign someone's forehead (I politely declined). Here I am signing more traditional objects: Books and bookmarks.